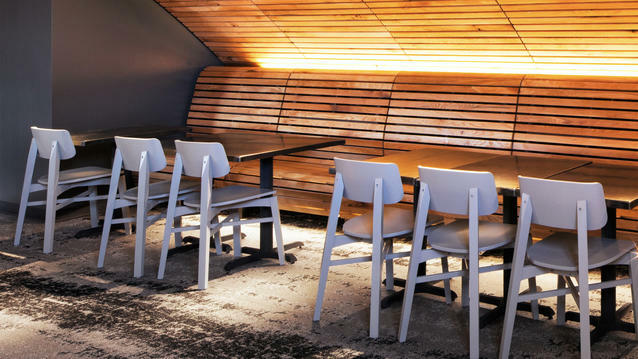 Discover how Tarkett flooring helps transform an old seed warehouse to a modern day Asian eatery. As the needs of a community grow and evolve, architects and designers play a significant role in adapting existing structures to fulfill entirely new purposes. Tarkett calls this theme Purpose Positive, and it’s one of four cultural mega trends being discussed in our Neoculture CEUs. Converting churches into restaurants, shopping malls into apartments, office parks into universities—adaptive reuse has become an artful way to both honor a community’s heritage, while building its social and economic future. Lucky for Jina Yoo, restaurateur and owner of the new LeBao Asian Eatery in Columbia, Missouri, food is the most critical installation of any adaptive reuse project. And nothing tells the Neoculture story better than a perfectly executed culinary fusion. Working closely with a branding agency out of St. Louis, Shelley and team translated LeBao’s color palette into unique interior finishes, using branded wall graphics to tie the restaurant’s upstairs sophistication with its downstairs casual vibe. To take care of the ceiling’s aesthetic and acoustical challenges, custom linear wood cladding was built. “It was intended to look as though the ceiling is flowing naturally down the walls and morphing into the benches,” explained Shelley. To further assist with second floor acoustics, the team knew they’d need a soft floorcovering. Tarkett’s Powerbond® was chosen for its incredible durability and ease of installation over adverse subfloors. “It was the perfect format for the stairs, and it made the second floor space seem richer, while not competing with the ceiling treatment. Though we were not concerned about staining on such a durable product, we felt the organic pattern would help disguise any potential spills. Jina was particularly concerned about soy sauce and red wine. The pattern in the Avant reminded us of the natural mottling in black steel, which was the bar top material and dining table tops,” said Shelley. And the results? Well, they sort of speak for themselves.